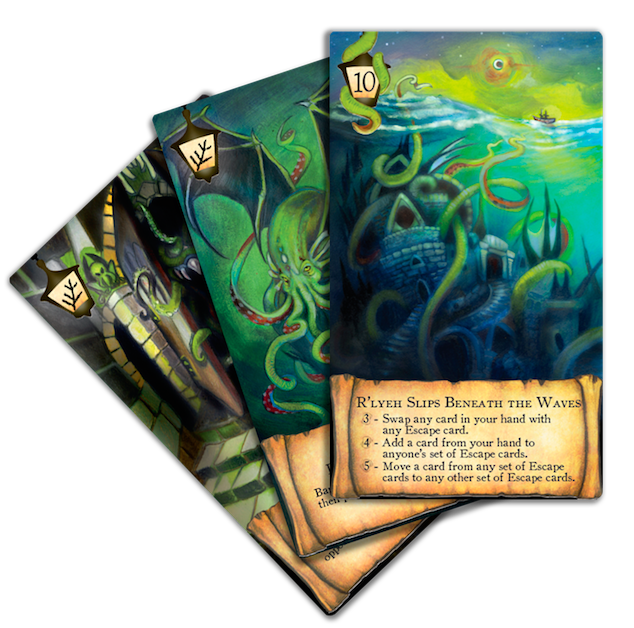 R'lyeh is a terrible and ancient city,risen from the depths of the Pacific by a great curse. There, Cthulhu lies both dead and dreaming, waiting to consume any who venture near. Choose each turn between play-anytime event cards and escalating horror cards as the best route to victory. Play the largest card sets you can to unlock ever-mightier powers. When the time is right, transition from playing cards from your hand to eliminating your array of escape cards. Decide each turn whether picking up the whole stack will help you win, even though you're ultimately trying to get rid of cards. Escape R'lyeh or go mad trying!